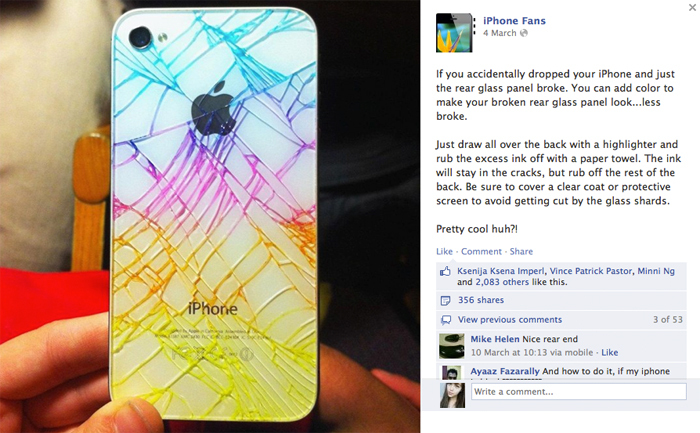 So previously when I mentioned cracking the back of my iPhone 4S, a few people suggested I try this below! The idea is to use markers/highlighters & simply colour the broken glass, letting the ink seep through the cracks to make a sort of... watercolour back. The idea is really pretty neat, but some made valid points about water damage (the ink seeping into your iPhone hardware). Anyhow I had my cracked back replaced (S$40 at Sim Lim, first level) & got to keep the piece! Since I didn't have to worry about possible damage I decided to try it. I used both highlighters as well as the popular 2-sided markers! Don't really find any difference between the 2 in terms of ink/seeping ability. You can see the drawing lines by the markers! Don't think it looks as nice as the example on Facebook LOL. But maybe it's my bad mix of colors. Like the yellow highlighter looks a bit too neon! And maybe my back panel isn't sufficiently cracked haha. After wiping with a tissue to remove excess ink! AND *IMPORTANT*, the whole piece did feel softer (behind the back panel is a kind of tape-like material & it's not completely hard) so I think the water damage concern is definitely valid! So... don't try it unless you're fine with risking your iPhone. P.S. I've already switched to an iPhone 5 haha. 5 comments on "Watercolour iPhone"
so cute! But you're right. The yellow looked a bit too neon so in the end, it doesn't show much.